Martaveous McKnight continues to come through in the clutch. You may not remember, and it doesn’t count for much, but the University of Arkansas at Pine Bluff was picked to finish eighth in the SWAC preseason basketball poll. 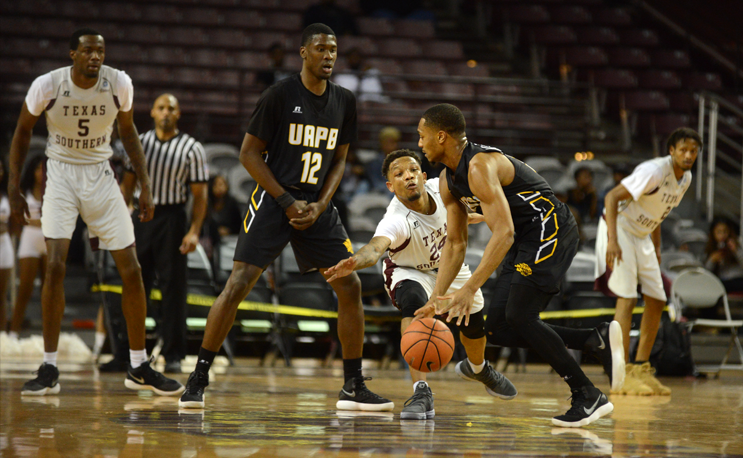 So far UAPB has managed to win eight of its first nine conference games and currently have a two-game lead for first place in the SWAC. Take that prognosticators. The Golden Lions were in a precarious situation on Monday night, trailing Jackson State by 15 points at halftime. UAPB stormed back by outscoring Jackson State 36-19 in the second half, including the game-winner from Martaveous McKnight with less than five seconds remaining. The Lions remain the king of the jungle so far, but there is a trio of Tigers lurking in second place. Grambling, Jackson State, and Texas Southern are all 6-3 hoping to make up ground before tournament time. Grambling is the only SWAC team to defeat UAPB so far, with a narrow 69-68 victory on Saturday night. Jackson State started conference play with six straight wins before losing its last three. Texas Southern, the preseason favorites, are moving on without their leading scorer after a mid-season suspension. Martaveous McKnight has been leading the charge for UAPB this season. He currently leads the SWAC in scoring at 18.9 points per game but there’s something to be said about the defensive effort of the Tiger trinity. In his last three games against Texas Southern, Grambling and JSU, McKnight was held to 14, 9 and 14 points respectively. In those games, he shot a combined 30 percent from the floor. Shooting percentage aside, McKnight has been clutch when it counted. He converted the infamous five-point play against Texas Southern to help win the game and buried JSU with the game-winner on Monday night. There are nine regular-season games remaining for UAPB, and they will face each of those Tiger teams one more time. Ultimately, the tournament is all that matters in the big picture because everyone in the SWAC is below 500 overall. The NIT and the NCAA won’t come calling with at-large invitations to their tournaments. So a regular season championship will be little consolation if one of your foes wins the conference championship and enjoys the spoils of March Madness. With the win, Jackson State earned their first three-game winning streak of the season.